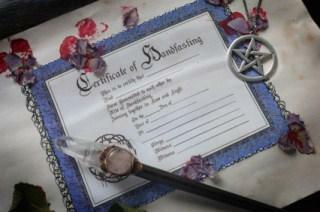 Print a handfasting certificate as a memento. A Wiccan wedding is very different from other religious ceremonies. Wiccans practice diverse beliefs, so no two wedding ceremonies will be alike. Whether you're new to the practice or a seasoned veteran, a few guidelines and reminders can ensure your special day is seamless. Handfasting is a tradition commonly found in Renaissance, medieval, pagan or Celtic wedding ceremonies, along with Wiccan ceremonies. While many of the vows and wedding readings in a Wiccan wedding will vary from couple to couple, handfasting is fairly universal amongst practitioners. During the handfasting, the couple's hands are symbolically tied together with a cord or rope to symbolize their union. The binding may be done for just a year or so and renewed annually, or the fasting may be valid as long as they love one another or forever, depending on the couple's preferences or beliefs. A Wiccan wedding ceremony is typically an outdoor wedding. Guest may stand inside a circle, with candles representing points in a pentagram. An altar may hold typical Wiccan ritual symbols - or it may not be present at all. Gods, goddesses, or Earth elements may be invoked during the ceremony. The diverse nature of those who practice Wicca indicates that each wedding ceremony within the religion is unique to the particular group beliefs to which the couple ascribes. Herbal Musings offers a short explanation of Wiccan weddings, including answering the "who, what, why, how and when" of creating your perfect ceremony. Both Wiccan and Pagan wedding handfasting ceremonies are discussed at Handfastings.org. A Practical Wedding has a Wiccan handfasting ceremony script example. The Cauldron has four different Wiccan handfasting and wedding examples to choose amongst. Universal Life Church Ministory offers an article on how to perform a Wiccan wedding. ReligiousTolerance.org has an extensive article on handfasting. Samples of other wedding ceremonies may be available from friends within your own Wiccan practice or from leaders in your group. Couples often have the option to alter any content of the handfasting ceremony or other parts of the ceremony script, which may include writing original vows. Get married by a Justice of the Peace in a civil ceremony and hold a handfasting or Wiccan ceremony later the same day or another day. Find someone who is both a Wiccan and legally certified to perform weddings. Check with your local Wiccan group or visit an online Wiccan community to find someone in your area. To make the marriage legal, you must follow all other rules in your state regarding legally binding weddings. This usually includes filling out an application for a marriage certificate, following the waiting period rules, and having witnesses present to sign the license. Not every Wiccan cares whether the marriage is valid in the eyes of the government. If the spiritual union is the only part of the ceremony that matters, and not the legality, then it is not necessary to make it legal. A Wiccan wedding is a wonderful option for its practitioners. Most followers choose to include the handfasting ritual within the ceremony, along with vows and perhaps wedding readings. If you want the marriage to be legal, make sure you find someone to perform the ceremony that is recognized by your state. No matter what kind of Wiccan wedding you have, the ceremony is sure to be meaningful as long as you honor your spouse and stay true to your beliefs.